The Garden Lights Sarasota Firebowl is a beautiful steel firepit with attractive diamond cutouts, handles, and a great trim detail. It offers a full 360 degree view of the fire. A large 23.5 inch diameter firebowl provides plenty of room for a roaring fire. The four decorative legs create a base that is both stable and stylish. This firepit comes with a spark guard and poker. 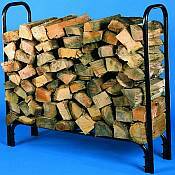 It can be used almost anywhere an outdoor fire is allowed and is sturdy yet portable. When the weather gets a bit cooler, you can sit next to a cozy fire with family and friends, drink hot chocolate, and enjoy the outdoors instead of staying indoors. 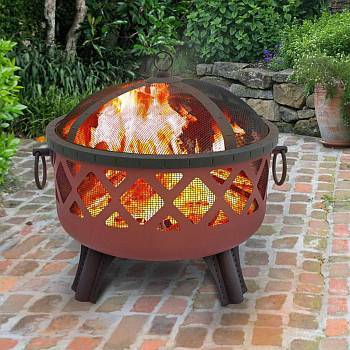 Kick back and relax by a nice fire in your own backyard while warm flames flicker through the unique cutouts in this wonderful firepit. Dimensions: 28.5" x 25" x 24.25"